The garment factory can produce both woven & knitted garments.It is designed to produce Men’s shirts& women’s blouses and trousers for men from light,medium & heavy weight & sets of jeans trousers & jackets. Cutting Section: It comprises 4 full size cutting tables,automatic cloth spreading & click press cutting machines. Design & Pattern Making Section:It comprises Computer aided designing & pattern Making unit(CAD/CAM) with digitizer & plotter. Make Up Section: A total of 825 sewing machines,about 84% of them Juki type of different varieties including:Single & double,three,four & five thread over lock machines,flst locks,two & three needle feed of the arms,& different specialized machines.Top fuse,collar,cuff & pocket form & pressing devices,collar centre making,sleeve attach & button fastening machines etc. 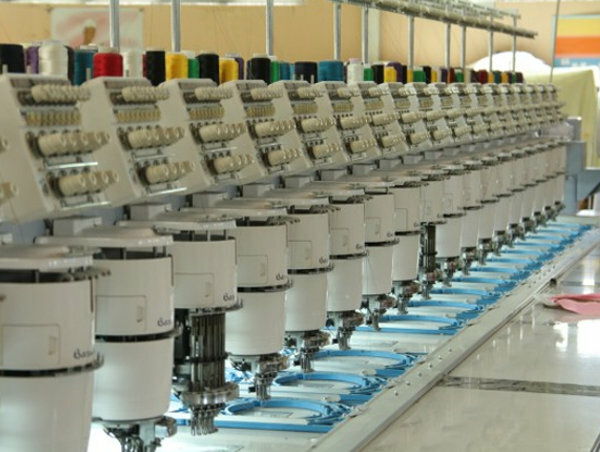 Embroidery Facilities: Five embroidery machines which are able to produce up to nine colors.Four machines which are having 10/10/1/1 Heads & 1 machine having 20 heads with a total of 42 heads. Finishing Section: Electric & Steam ironing machines,shirt folding devices,trousers opening & leg press seam machines,d/t finishing devices including:spot vacuum board & spray cleaning gun,automatic strapping machines,poly bag sealing machines & iron for thermo adhesive paper.Washing,dryer & Hydro extractor machines. Quality Section: It comprises fabric inspection,color cabinet,crock meter,strength tester,sample cutters & other tools & equipments. 4 million pieces of T‐shirt equivalent garments in one shift operation. At full capacity,the factory can accommodate more than 1200 employees in one shift operation.Currently,the factory has 874 employees. Suits, shirts, trousers, T‐shirts, polo shirts, jackets, dresses& blouses, gowns, trousers, overall & others.